In the north-east of Central Stockholm, a historical industrial site was earmarked for redevelopment. Part of the site comprised a former gasworks, where historical operations have caused a complex mix of contaminants to impact the surrounding soil, groundwater and shoreline sediments. The large site is due to be redeveloped in a series of parcels including a road, industrial park, residential homes and schools. Remediation is required to ensure the human health risk is removed as part of the restoration of the site. The impacted groundwater also represents an environmental risk and requires treatment. 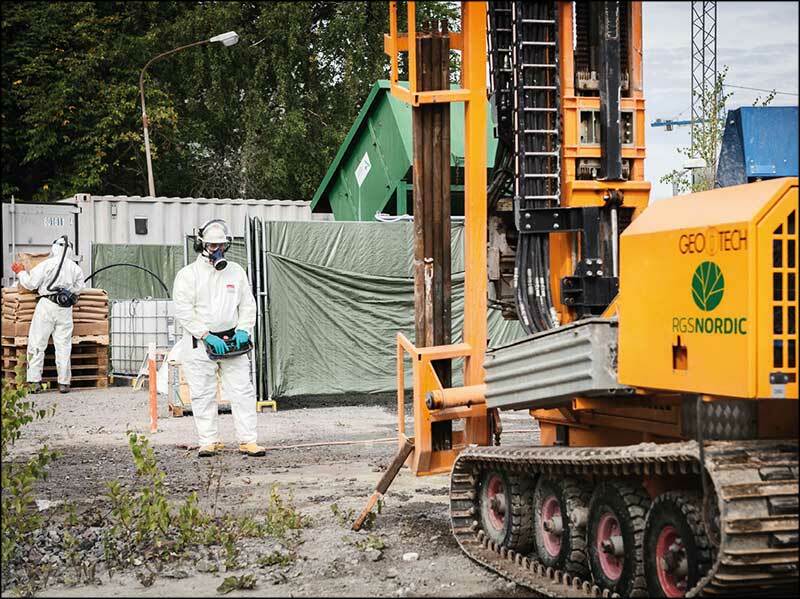 Risk assessments were used to determine that remediation was required to a depth of 20m BGL. The geology of the site is heterogeneous, comprising a shallow made ground, a clay layer and underlying coarse sands. The sands are highly impacted with a range of gas works contamination included creosote NAPLs and high levels of benzene. The saturated clays are also impacted with dissolved phase contamination. Due to contaminants, concentrations and superficial geologies, a range of remedial methods would be required to ensure the most appropriate was used in each scenario. Therefore, RGS Nordic engaged REGENESIS to design a series of pilot tests utilising several in-situ methods. The results from these trials would then be used to shape the full-scale remediation strategy for the entire gasworks site area. Enhanced aerobic degradation using ORC-Advanced to target the low dissolved phase benzene and naphthalene concentrations in the clay. >95% reduction in dissolved phase benzene was achieved with the addition of PetroCleanze. 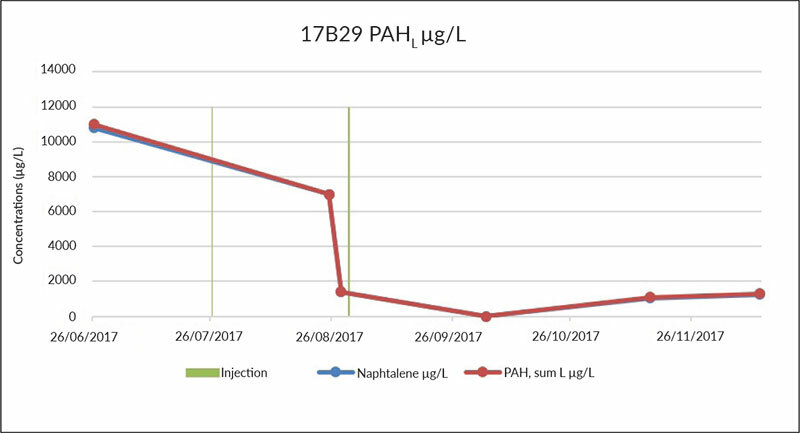 The treatment for PAHs was found to be less effective, primarily due to the low baseline PAH concentrations which were below the optimum treatment concentration range for PetroCleanze. >90% reduction in dissolved phase benzene and PAHs was observed using PersulfOx. In the RegenOx trial, dissolved benzene concentrations were found to decrease by 80%, while PAH levels increased slightly, potentially due to large volumes of desorbed COCs being released into groundwater post-treatment. 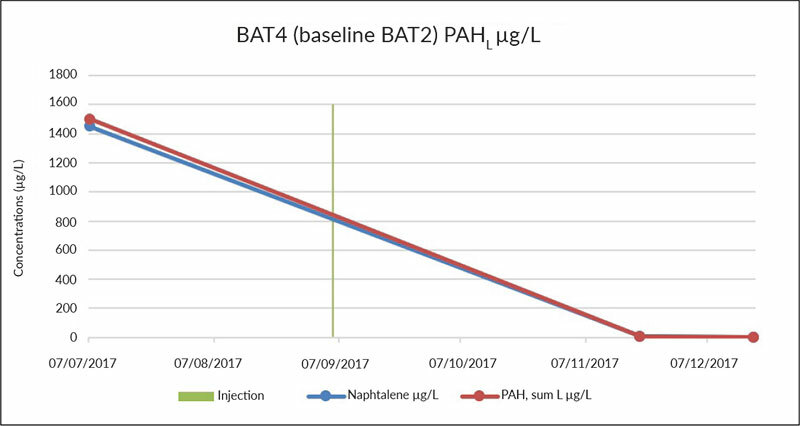 A sustained reduction in Naphthalene and benzene (despite suspected influx into the test area) was achieved using ORC-Advanced in the saturated clay. A wide range of contaminant concentrations were treated effectively using a combined in-situ remediation approach. Substantial reductions in COC concentrations were achieved despite the challenging geological setting.